Myanmar and Thailand are good neighbours which are indivisible territorially, culturally and spiritually. So there are no major border issues between them thanks to the bilateral negotiations. The military relations have been further cemented after 2011. The continuous contacts from Regional Border Committee Level to High Level Committee between the two Armed Forces and the government-to-government contacts and meetings at all levels reflect the good relations between the two countries, said Commander-in-Chief of Defence Services Senior General Min Aung Hlaing at his meeting with Minister of Foreign Affairs of Thailand H.E. Mr. Don Pramudwinai at the parlour of Zeyathiri Villa here this afternoon. 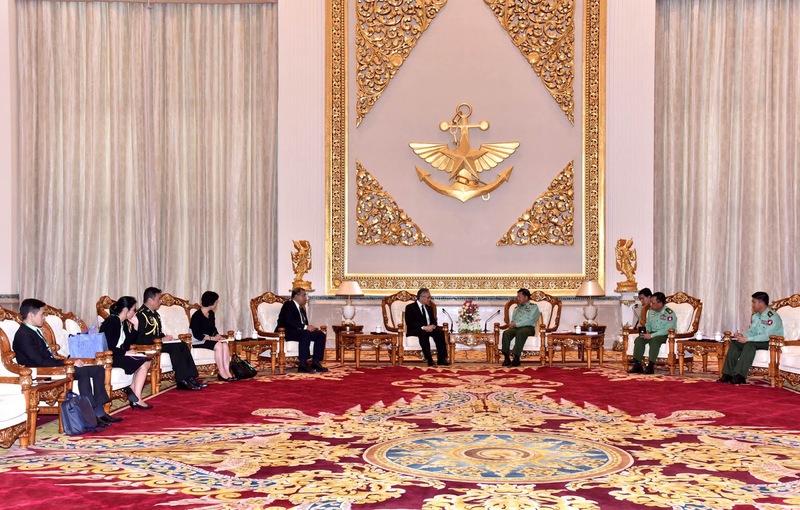 Also present at the meeting together with the Senior General were Lt-Gen Soe Htut and senior military officers of the Offi ce of the Commander-in-Chief (Army). The Thai Foreign Minister was accompanied by Ambassador of Thailand to Myanmar H.E. Mr. Jukr Boon-Long and officials. During the talks, the Thai Foreign Minister said although the two countries share a long common border, there are no major issues. There are excellent relations between the two Armed Forces and the bilateral relations between the Ministries of Foreign Affairs of the two countries are also good. There are also close cooperation and mutual support. Thailand supports the stance of Myanmar government. Although there is progress in the government’s action in connection with the Rakhine issue, it needs time to solve it. 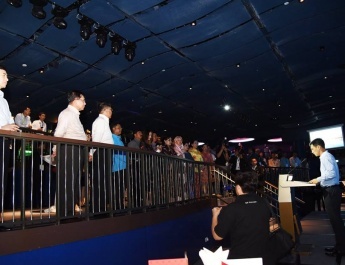 Thailand understands the complicated nature of the issue and the requirement of time, as the country had also faced a similar situation, Thailand views the issue as a matter that must be solved through short-term, midterm and long-term programs from a comprehensive outlook. 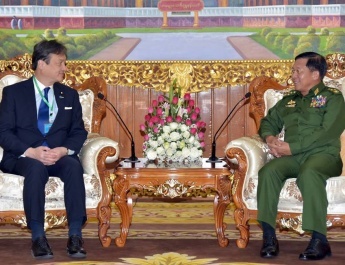 Then, the Senior General discussed that although it needs to measure some parts of boundary between Myanmar and Thailand sharing more than 2,000 kilometres long common border each other, both countries have no big border problem. Despite solving boundary affairs with all neighbouring countries in the peaceful way, Myanmar faces some problems in its western part. With regard to the issue of Rakhine State, the Senior General continued to say that the majority of global countries put pressure on Myanmar based on accusations by media without knowing true events in Myanmar. Whatever it may be, it must accept the truth. The issue of Rakhine State was made under preparations based on the events which happened in many years. Myanmar cannot accept anyone as citizens without scrutinizing and identifying them. Conducting the citizenship scrutiny started the problem. In the incident, about 4,000 Bengali terrorists started attacks in synchronization with superior strength but security forces did not carry out attacks and killing with superior strength and terror acts. True stories cannot be covered. 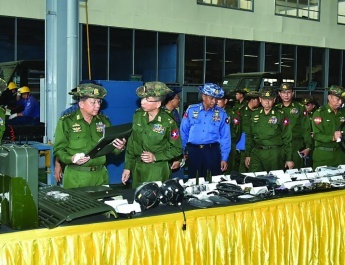 The Tatmadaw will carry out all processes with correct stance. 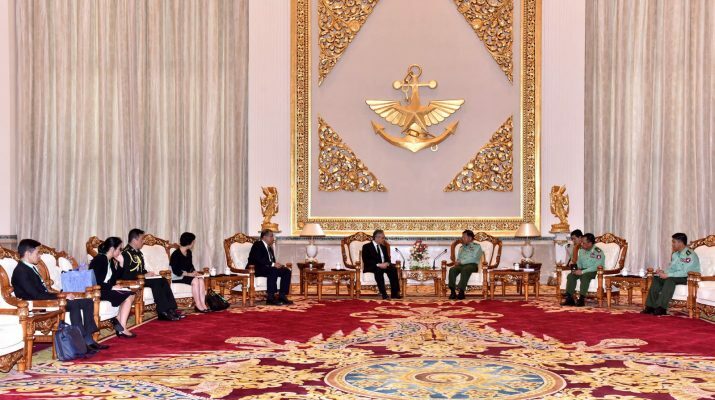 The Tatmadaw is helping the Central Committee for the Implementation of Stability, Peace and Development in Rakhine State led by State Counsellor Daw Aung San Suu Kyi have success in the tasks. Afterwards, they exchanged views on needs of international community to know true events on Rakhine issue due to unbalanced expression in the arena of international media, situations to contribute towards solving problems through discussions based on experiences of both countries, and promotion of cooperation between the two armed forces of two countries through good friendship and mutual trust with brotherly spirit for ensuring emergence of the eternally peaceful border region. After the meeting, the Senior General and the Thai Minister of Foreign Affairs exchanged commemorative gifts.